UNITED NATIONS, Sep 25 2018 (IPS) - In honour of Nobel Peace Laureate Nelson Mandela’s legacy, nations from around the world convened to adopt a declaration recommitting to goals of building a just, peaceful, and fair world. At the Nelson Mandela Peace Summit, aptly held in the year of the former South African leader’s 100th birthday, world leaders reflected on global peace and acknowledged that the international community is off-track as human rights continues to be under attack globally.Guterres highlighted the need to “face the forces that threaten us with the wisdom, courage and fortitude that Nelson Mandela embodied” so that people everywhere can enjoy peace and prosperity. 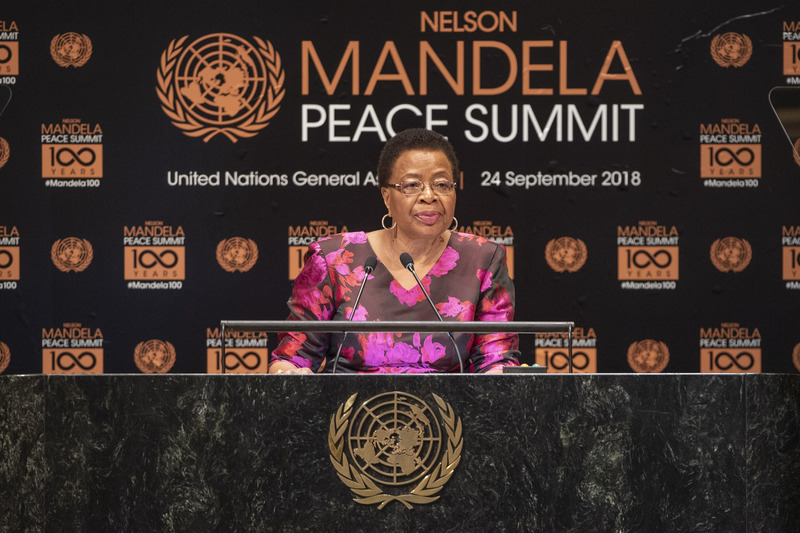 “The United Nations finds itself at a time where it would be well-served to revisit and reconnect to the vision of its founders, as well as to take direction from Madiba’s “servant leadership” and courage,” said Mandela’s widow, and co-founder of the Elders, Graça Machel. The Elders, a grouping of independent global leaders workers for world peace and human rights, was founded by Machel and Mandela in 2007. Imprisoned in South Africa for almost 30 years for his anti-apartheid activism, Mandela, also known by his clan name Madiba, has been revered as a symbol of peace, democracy, and human rights worldwide. It is these goals along with his qualities of “humility, forgiveness, and compassion” that the political declaration adopted during the Summit aims to uphold. However, talk along of such principles is not enough, said Amnesty International’s Secretary-General Kumi Naidoo. “These are words that get repeated time and time again without the political will, urgency, determination, and courage to make them a reality, to make them really count. But we must make them count. Not tomorrow, but right now,” he said to world leaders. “Without action, without strong and principled leadership, I fear for them. I fear for all of us,” Naidoo continued. Both Machel and Naidoo urged the international community to not turn away from violence and suffering around the world including in Myanmar. “Our collective consciousness must reject the lethargy that has made us accustomed to death and violence as if wars are legitimate and somehow impossible to terminate,” Machel said. Recently, a U.N.-fact finding mission, which reported on gross human rights violations committed against the Rohingya people including mass killings, sexual slavery, and torture, has called for the country’s military leaders to be investigated and protected for genocide and crimes against humanity by the International Criminal Court (ICC). While the ICC has launched a preliminary investigation and the U.N. was granted access to a select number of Rohingya refugees, Myanmar’s army chief General Min Aung Hlaing warned against foreign interference ahead of the General Assembly. Since violence reignited in the country’s Rakhine State in August 2017, more than 700,000 Rohingya fled to neighbouring Bangladesh. Still some remain within the country without the freedom to move or access basic services such as health care. This year’s U.N. General Assembly president Maria Fernanda Espinosa Garces of Ecuador said that while Mandela represents “a light of hope,” there are still concerns about collective action to resolve some of the world’s most pressing issues. “Drifting away from multilateralism means jeopardising the future of our species and our planet. The world needs a social contract based on shared responsibility, and the only forum that we have to achieve this global compact is the United Nations,” she said. Others were a little more direct about who has turned away from such multilateralism. “Great statesmen tend to build bridges instead of walls,” said Iranian president Hassan Rouhani, taking a swipe at U.S. president Trump who pulled the country of the Iran nuclear deal and has continued his campaign to build a wall along the Mexico border. Trump, who will be making his second appearance at the General Assembly, is expected to renew his commitment to the “America First” approach. Naidoo made similar comments in relation to the U.S. president in his remarks on urging action on climate change. “To the one leader who still denies climate change: we insist you start putting yourself on the right side of history,” he told attendees. Trump, however, was not present to hear the leaders’ input as he instead attended a high-level event on counter narcotics. Guterres highlighted the need to “face the forces that threaten us with the wisdom, courage and fortitude that Nelson Mandela embodied” so that people everywhere can enjoy peace and prosperity. “History will judge you should you stagnate too long in inaction. Humankind will hold you accountable should you allow suffering to continue on your watch,” she said. “It is in your hands to make a better world for all who live in it,” Machel concluded with Mandela’s words. In addition to honouring the centenary of the birth of Nelson Mandela, the Summit also marks the 70th Anniversary of the Declaration of Human Rights and the 20th Anniversary of the Rome Statute which established the ICC. Opinion: Mandela Day – Where Do We Stand Today?